We’re sure you’re familiar with AVG Antivirus, which has been keeping computers safe for 25 years. 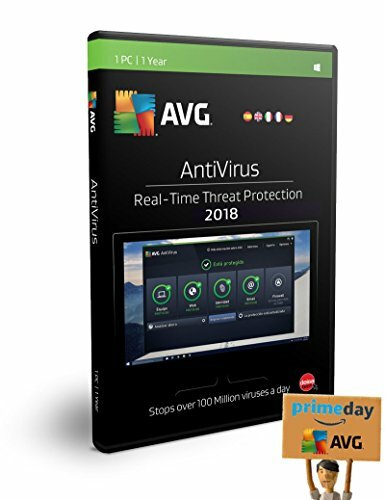 The software launched in the Czech Republic before eventually going global, and has rolled out regular yearly updates, but this latest version is the first since the company was taken over by its rival, Avast Software, last year. Despite the buyout, there are no dramatic changes to the software. The program has a new look, as each progressive version does, but maintains its familiar black-and-green color scheme. The main screen is divided into two sections – Basic Protection and Full Protection. The latter safeguards you from hacker attacks, hides your private files and offers payment protection when you’re shopping online, but you’ll need to upgrade to the paid-for edition to unlock this functionality. There are plenty of welcome changes throughout the software, though, such as the introduction of Pushed Priority Updates. These ensure that free users get the same speedy updates and protection enjoyed by owners of paid-for AVG products. 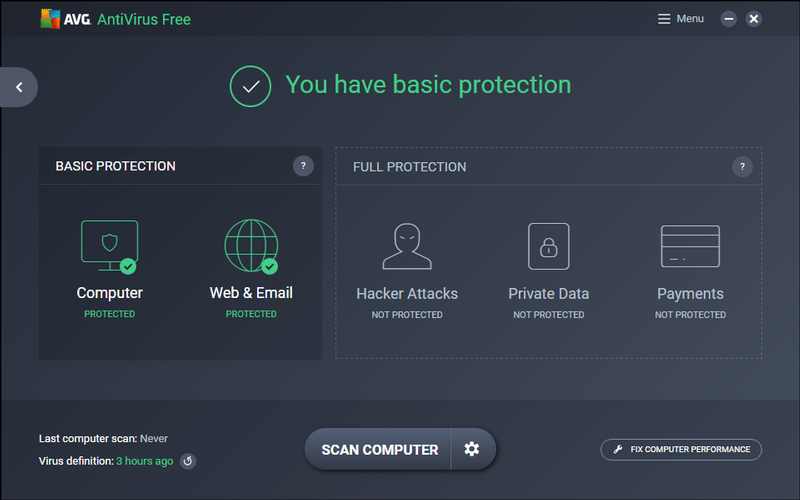 This 17th version of AVG Antivirus uses Avast’s cloud-based file scanner, CyberCapture, to protect your PC against zero-day threats, and has an improved Online Shield that blocks malicious links and files when you’re browsing the web. The software can also identify performance problems. 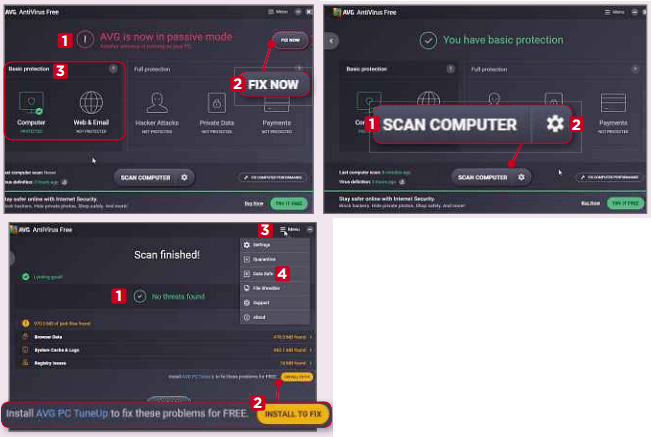 You can now use AVG as a second line of defense, as well as your sole security program, because it will install and run without problems alongside any existing antivirus software you might have installed. If, during setup, it identifies an antivirus program already on your system, it will install itself in ‘Passive Mode’ to avoid any potential conflicts. Happily, it appears that AVG fans, who may have thought the program would change radically – or even be scrapped altogether – under Avast’s ownership, needn’t have worried. 1 During installation, you can choose the Custom option to specify the components you want to include. From the Zen menu, click the Antivirus Free button. If the software is in Passive Mode (being used as a second line of defense), it will be shown here. 1 You can also turn off this mode. 2 Basic Protection shows you which modules are active. 2 To check your PC for threats, click the Scan Computer button. 1 Clicking the cog 2 lets you choose the type of scan you want AVG to run: Full Computer, Deep Virus, USB/DVD, File or Folder, Performance or Boot-time. You can also schedule scans from the same screen. 3 Once you’ve run a full scan, the results screen will display any threats it’s found, 1 along with any junk files. However, you need to install AVG PC TuneUp to fix these problems for free. 2 The menu button 3 provides access to Settings, Quarantine and the File Shredder. Data Safe 4 is only available in the paid-for edition of the program.